So, I think I’ve mentioned I’m a geek, right? Pop culture on the brain: TV, film, music, and yeah, comic books. So comics translations to other media have always held a special interest for me. While I realize this is a TV column, I felt that, as cheekymonkey’s resident lowbrow, it fell upon my shoulders to comment on SPIDER-MAN . But let me tie it in with some small screen crimefighters using one common thread that’s been missing from superhero adaptations for some time. I had a feeling SPIDER-MAN would be big, but even I, a fella with a handful of Spidey comics and action figures, was surprised at the fervor. The extent of Spider-mania in Manhattan was evidenced by the presence of Lou Reed and Laurie Anderson sitting in front of me when I saw it on opening weekend! I liked SPIDER-MAN, bad f/x, rampant product placement, reeeeally bad soundtrack and all. I liked the casting (with the large exception of the remarkably bland Kirsten Dunst as Mary Jane Watson) and thought the movie had a nice pop to it. I was relieved it only had one villain (even if I wasn’t crazy about the high-tech costuming of the Goblin). But the most amazing thing about SPIDER-MAN was (aside from necessary updates) how faithful it was to its source material. Until Sam Raimi, a self-professed fanboy himself made a huge point of making sure his Spider-Man felt like the Spidey of Stan Lee and Steve Ditko (and John Romita and Gil Kane and Gerry Conway...). I haven’t read Spider-Man comics in about fifteen years, but I sat in that theater with a big, stupid grin on my face the whole time. On the small screen, SMALLVILLE, the latest incarnation of Superman is a surprise success. The WB network TV show succeeds where the truly embarrassing LOIS & CLARK failed: to flesh out Clark Kent and show us the “Man” behind the “Super,” even if the man is a pretty BOY who won’t don the red, blue & yellow costume for many years. SMALLVILLE tinkers with the legend more than any previous Superman incarnation (okay, except for maybe the “Great-Wall-of-China-rebuilding-vision” from SUPERMAN IV ), but at its heart is a true understanding of the character. I never bought the old chestnut about Superman being boring because he’s so virtuous (the “overgrown boy scout” line). In this cynical, narcissistic world, true altruism is a rarity, and the concept of someone who possesses absolute power, but is totally uncorrupted by it is supremely fascinating. It’s a character trait that ‘s been examined much in the comics, but usually doesn’t come across in Superman’s live translations. SMALLVILLE shows us young Clark Kent learning to use his developing powers, feeling conflicted about what they will mean and unsure of his place in the world. SMALLVILLE certainly isn’t perfect. Some of the episodes read like a B-grade episode of THE X-FILES and Kristin Kreuk as Lana Lang is as hard to take as too much Sweet-n-Low. But it should be interesting to watch the series develop, culminating perhaps in a final episode some seasons from now where the last shot is of Tom Welling putting on the Superman costume for the first time? Curiously, the weakest current superhero adaptation comes from a crew who, up till now had a perfect track record. The Cartoon Network’s JUSTICE LEAGUE cartoon is a huge disappointment from the animation team that previously produced the excellent BATMAN, SUPERMAN and BATMAN BEYOND series in the 90’s. And what makes JUSTICE LEAGUE suffer is the lack of the very thing that makes both SMALLVILLE and SPIDER-MAN work: costumeless character development. Aside from Green Lantern, whose alter ego of John Stewart (not to be confused with Jon Stewart, but that would be great) is not a secret, and Wonder Woman, who has no secret identity (she’s just Princess Diana of Themiscyra), we never see the Justice League in their normal lives, which makes the characters very, well, two dimensional. In November of 1994 (in the previous incarnation of this column), I incorrectly predicted that a big screen adaptation of the X-MEN “will never happen.” Part of my reasoning was that too many colorful costumes make suspension of disbelief impossible, and the movie dealt with that by putting the X-Men in matching leather jumpsuits (“what would you prefer, yellow spandex?”). While X-MEN was not a bad movie, it certainly had that air of dismissal towards its source, a cynical wink to the audience that this was no wussy cartoon. Costume alterations aside, we seem to be entering a new era of acceptance of comic book adaptations as more than kiddie diversions. Besides both HULK (directed by Ang Lee, and what was CROUCHING TIGER, HIDDEN DRAGON but a very lyrical superhero movie?) and DAREDEVIL (starring Ben...oof...Affleck) next year, the WB will premiere BIRDS OF PREY this fall (about the Black Canary, the Huntress and Oracle, the ex-Batgirl), X-MEN 2 is filming, BATMAN: YEAR ONE is still in the works, and countless more comics are in various stages of development. This is nothing new, but I think we may be seeing a slightly different tone in many of these. 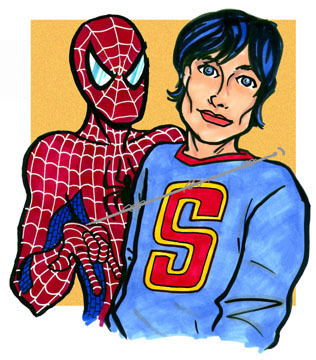 What SPIDER-MAN and SMALLVILLE have in common (aside from annoying redhead love interests) is how utterly sincere and cornball they are. They are the polar opposites of the nihilism of Tim Burton’s BATMAN films, much more akin to Richard Donner’s SUPERMAN: THE MOVIE . But for the first time in a long time, it’s acceptable to be corny. Heartfelt sentiment is not immediately cause for derision. These days, it’s possible to say that you stand for “truth, justice and the American way” without sounding jingoistic. While both SMALLVILLE and SPIDER-MAN were well under way before September 11th, I think it’s safe to say that the events of that day whetted the public’s appetite for this specific type of escapism. This is the struggle of Good Vs. Evil, but where Evil is defeated by a Good that’s not only pure of intent, but something that we are, sadly, not: Invulnerable.